October 12, 2008 …Muslim Day Parade…. | the "silent" majority no more! 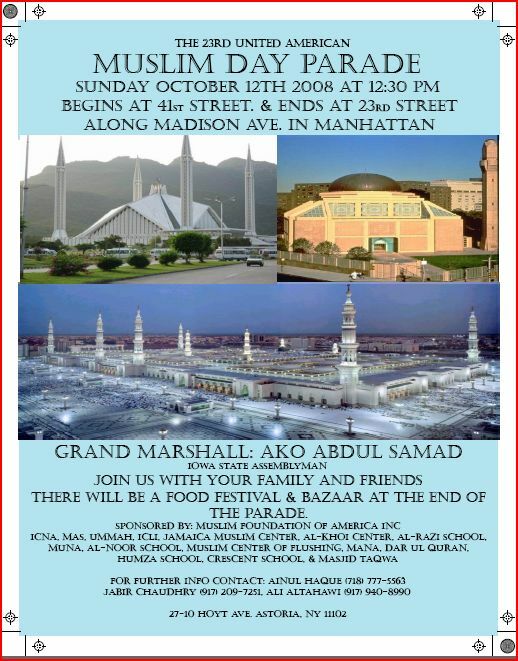 October 12, 2008 …Muslim Day Parade…. Will be at Muslim Day Parade! A DAY WE SHOULD BE SAYING “REMEMBER THE USS COLE”! And Ends at Madison and 26 St.
Last year they spent a HOUR praying on Madison Avenue BEFORE the Parade. At the end of the parade. There will be a Street Faire from 26 st to 23 St…filled with LOTS of Da’wa tables. And Speakers! One of last year’s speakers referred to Harlem as the Mecca of New York City! We Must Not Be Silent! Say No to Creeping Sharia! Please! Pass this info along to everyone you know!!!! We should REMEMBER THE USS COLE on this DAY And CELEBRATE Columbus Day! WE WILL NOT BE SILENT!! Meet up at Madison Avenue and 27th St.
CONSTITUTION FOREVER • SHARIA? NEVER! •THIS AIN’T BRITAIN – No SHARIA HERE!